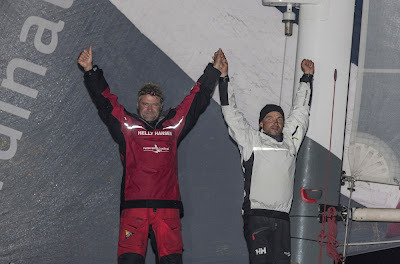 Itajai, Brasil Friday 0540hrs UTC Detail Erwan Le Roux and Yann Elies crossed the finish line of the Transat Jacques Vabre double handed race from Le Havre to Itajaí, Brasil at 03h 40min 15s local time, (05h 40m 15s UTC / GMT) early this Friday morning to win the Multi50 class. 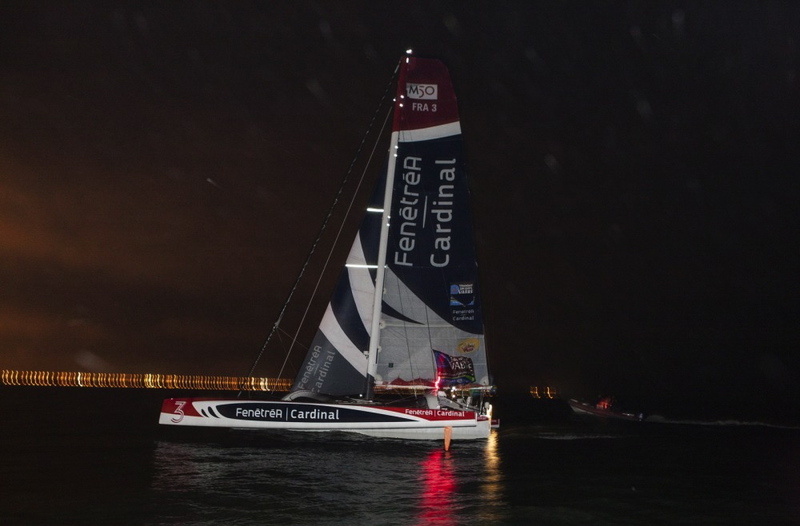 FenêtréA-Cardinal’s elapsed time since leaving Le Havre on Thursday 7th November is 14d 17h 40min 15s. Their average speed on the theoretical course of 5,450 miles is 15.3kts. They actually sailed 5872 miles on the water at an average speed of 16.6kts. The French duo finished at pace, covering the final miles into the finish line off the city in southern Brasil at around 20kts to close out a well earned victory. Le Roux and Elies have lead their fleet since 12th November – except for one day on 16th November when their rivals seized the lead for a matter of hours. In a thrilling final head to head match race down the Brasilian coast they kept their only real challengers in check. Second placed Actual, sailed by Yves Le Blevec and Kito de Pavant, were within 16 miles of the class winners yesterday morning (Thursday). Actual were around making 12-13 kts at 80 miles from the finish line as the winners crossed. Le Roux and Elies were jubilant as they touched the dock in Itajaí’s race village for the Transat Jacques Vabre. 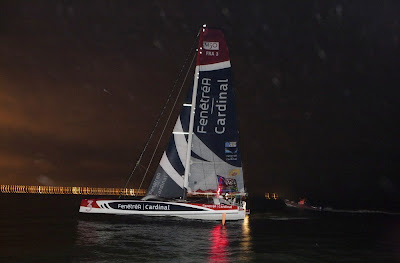 They arrived with their Multi50 completely intact, recalling how unsettled they were when rivals Arkema Region Aquitaine capsized 12 days ago and how they battled hard to stay ahead of nearest rivals Actual in a head to head dogfight down the Brazilian coast to Itajaí. Even last night Yves Le Blévec and Kito de Pavant were only 15 miles, less than one hour behind, and, they revealed this morning saw one of their two hairiest moments, coming close to capsizing. 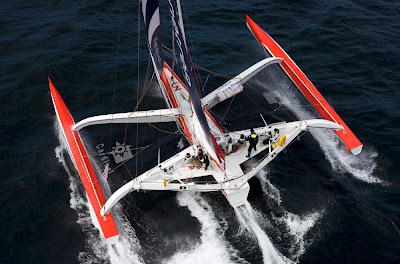 For Le Roux, victory with the 2009 launched Multi 50 which was the former Crepes Wahou!, on the longest course yet for the Transat Jacques Vabre more than makes up for narrowly missing out on the overall win in this summer’s Route des Princes fully crewed race around Europe. It is the second time Le Roux has won the class, the first time as skipper. Winning today follows up on his victory as co-skipper with Franck Yves Escoffier when they won this race on Crepes Wahou! In 2009 into Costa Rica. ‘Winning as skipper is all the sweeter’ was Le Roux’s conclusion this morning. And for Elies, winning on his first major double handed multihull ocean race caps a remarkable season after making history this summer becoming the first sailor ever to win back to back solo Solitaire du Figaro races, adding an incredible comeback overall victory to his win of last year. Elies’ appetite for multihull racing is clearly whetted.